Venetian Blinds have a timeless and attractive look, it is very easy to install and affordable to any homeowner. Venetian blinds can be made of plastic, wood and aluminum. 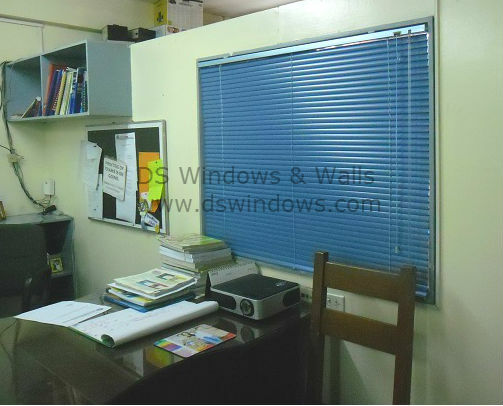 One of our client who works as high school teacher in Zapote, Las Piñas City opted for aluminum mini blinds for their classrooms and faculty room. He selected aluminum mini blinds because it is in its very low cost and it has a wide range of colors to choose from. Although aluminum blinds is low cost, but its durability and sturdiness much better. Aluminum blinds helps bring more elegant and expensive looks to the place. Our client selected a SATIN STRAT BLUE color for their blinds because it is soothing to the eye especially to his students, it can help them to feel relaxed and feel comfortable so that they will study more with concentration and focus. It also provides excellent privacy and very easy to operate in controlling direct sunlight and glare, this might help them to boost their learning and study skills. 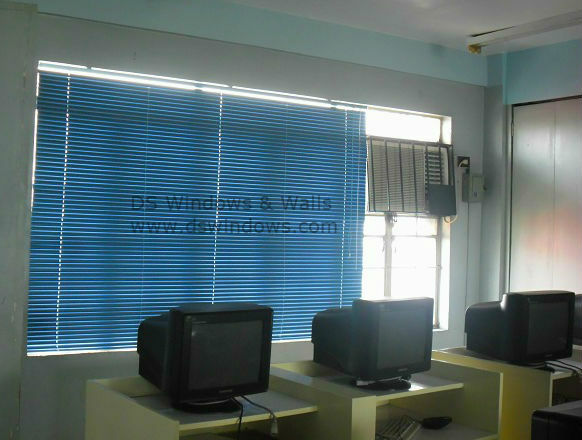 DS Windows and Walls offer a lot of varieties of window blinds, folding doors, wallpapers and carpets. We are offering a FREE measurement and FREE installation if you purchased worth 5,000 and up for window blinds and folding doors within Metro Manila. For inquiries and more information, you can browse our main website www.dswindows.com or call us at (02) 893-1373 / (02) 403-3262 / 0916-311-3909 or e-mail us at inquiry@dswindows.com. You may visit our showroom located at 4th Level Waltermart, Makati City, 3rd Level Robinsons Metro East, Pasig City and 2nd Level Pacific Mall, Lucena City.